We are in the process of upgrading ccComputing.org and we are doing it on the live website. Please bear with us as we improve our service descriptions and design to better serve you and help you understand what we can help you with in your daily computing issues. We offer website solutions that include a variety of integrated online tools and services. Our hosting servers are all SSD driven for faster page loads resulting in better search engine rankings. No local business in Englewood should be without a website to promote their business. Computer Speed Security & Reliablility. Maximize your laptop with a thorough Laptop and Computer tuneup in the comfort of your home. Custom P.C. (personal computers) for gaming, day trading, 3d modeling, and 3d printing. We have the knowledge, experience and know how to build the highest performance PC for your particular field. Architectural, Mechanical design, medical, day trading, gaming.... We can custom design components for top performance in your field. Enjoy the benefits and convenience of a secure wireless home or office network. We will help with network setup, network security settings, network configuration and file sharing for printers, computers, laptops and other network devices. Affordable installation services of cat 5, cat 6, and coaxial cable for data and voice network infrastructure for small business and residential locations. Cat5/6 is suitable for both voice and data. Its bandwidth capabilities satisfies the bandwidth needs for most data, VOIP and networking systems used today. Computer Repair in Florida for Englewood, Venice, Nokomis, North Port, Cape Haze since 2008!! We have been providing personalized IT (Information Technologies) services including computer repair to the residents and select small businesses in the area for ten years now. 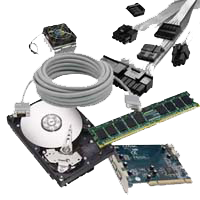 We provide flat fee computer repair in our computer repair shop for residential clients that is comprehensive and leaves the client with the best possible performance for the particular machine. For in-home service we provide IT services and computer repair at an hourly rate and this proves useful for those still running home based business and those moving financial software to a newly purchased computer, and in many cases our beloved seniors who may not be able to physically come to the shop or move a computer offsite. There are those situations where the work has to be in-home such as printer setup, modem / router setup, wireless network setup, even TV setup with internet access when needed. One bonus we offer is free Ram Upgrades and Free parts upgrades if we have any used equipment available to us at the time. If we get parts for free, you get parts for free. There are no price markups on new equipment we order for repairs and upgrades. During a computer revitalization (tune up), we check your RAM capacity and possible empty slots against the stock we have, and if it fits you get it with your tune-up. O.K We want to make clear at ccComputing.org that a tune-up = computer repair!! If you don't do it all, the computer isn't tuned. A tune-up should have an end result that the machine is running it's best, for what that machine is capable of. This would consist of solving any issue that has arrised or is persisting, whether software, hardware, Operating System failures, Viruses, Spyware, Trojans and the likes of Popups and unknown programs. Folder cleanups of all the software that doesn't clean up properly after itself, emtying of all tmp and temp files for the system and software. Cleanup of the hidden system folders and temp files, Registry cleanup and backup. So we have a flat fee, if you are bringing in an expensive hardware repair such as an LCD screen replacement, we will run the revitalization tune-up on the machine to test said hardware for reliablitlity whilst ensuring top performance. This is all included in the flat fee. It all depends on the particular issues at present.